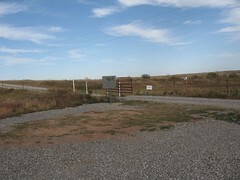 Visible Immediately to the east are prominent Trail ruts created by cattle herds and the Ft. Sill - Ft. Arbuckle supply road. Two miles east - southeast, beyond the crest of the hill visible across the valley, the cattle road intersected and joined the east - west Ft.Sill - Ft. Arbuckle supply and stage coach road to avoid the impenetrable cross - timber oak forests blocking a direct route to the north. Cattle drovers followed the established supply road for about seven miles west until it skirted the forest and were again able to turn north. 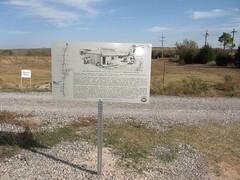 the combined passenger, freight, and cattle traffic no doubt inspired William Duncan, a Scottish tailor at Ft. Sill married to Chickasaw woman, and the town of Duncan's namesake, to purchase a trading post and store in the mid - 1870's located on the west side of Cow Creek, visible just to your east. the road crossed the ridge, descended to the creek, and forded it at a crossing at the pecan orchard you see to the southeast. As the trail climbed out of the creek bed and headed this way, it passes the remnants of two dugouts, all that remains of the original Duncan Store. 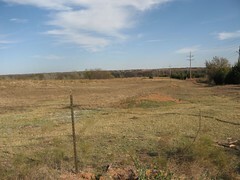 Located on the north side of the street near the gate of a private drive near about a block east from the corner of N Eastern Dr. and E Chestnut Ave. in Duncan, OK. Look for the brown Chisholm Trail Historic Site sign.